A young filmmaker hears music for the first time and discovers the final piece of his puzzle. Austin Chapman (’11) considers himself fortunate. He has access to something that 90 percent of the world’s population does not: pure, absolute silence. Chapman was born profoundly deaf and, until last August, had relied on a particular hearing aid to amplify most sounds. But when he tried a new technology—the Phonak Naida S IX UP—he wasn’t prepared to hear, for the first time, the cacophony of sounds that slip into most peoples’ subconscious. 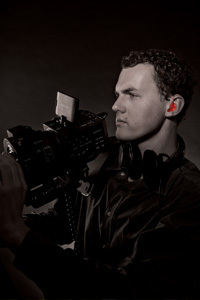 While Chapman’s new hearing aids have opened his world to hearing and understanding the nuances of everyday sounds, they have transformed the way he approaches his passion and profession: filmmaking. As a first grader, Chapman was unable to hear a sound and could only communicate with his interpreter. None of his classmates knew sign language, so he turned to novels and film for entertainment. By the fifth grade, as his speech improved, he began making short films with his best friend Taylor Bonin; the first was a spoof of the local nightly news broadcast. They now work side-by-side at Art of the Story, a production company and accompanying website that Chapman launched in 2011, with Bonin serving as the director of photography. It was at Pepperdine that he was able to tap into years of creativity and share them out loud. His first opportunity came by way of the annual student-run REEL Stories FilmFest, where he won the Excellence in Cinematography Award for At the Altar, a film about a boy sentenced to execution and the circumstances that led him to that moment, all told in flashback. “That experience was the first moment I realized I loved the process of creating a film as much as writing and resolved to better myself as a director, editor, producer, actor, cinematographer, and writer,” he recalls. For the competition the following year Chapman produced City of Widows, a documentary about what happens to young women in India after their husbands die, and Eleven Eleven, a hauntingly beautiful film about a young, hearing-impaired man who finds his soul mate and loses her to death the next day. The former won the REEL Cause Award and the latter won the festival’s Grand Prize and the Audience Award at the second annual event. “That experience cemented my drive to create beautiful stories using the lyrical language of film. I lost my fear of failure and found a new one: not trying hard enough. Still, deciphering and applying music to his shorts remained the missing link in his filmmaking. “Film is an amalgamation of storytelling mediums: novel, theatre, photography, and music. Up until now, I have built my stories using three of the four. I left the music up to my composer and could only give information—not feedback." “I can hear music for the first time ever, what should I listen to?” Chapman inquired of the web audience via Reddit last summer, seeking to broaden his sound comprehension. Eight months and over 14,000 comments later, Chapman has compiled a playlist of tunes that spans centuries, from the origins of music to more current and popular genres (see box for some of his favorites). Adjusting to this transition has been difficult as Chapman learns to separate sounds. His greatest challenge is understanding the sounds he hears, memorizing how they sound, and associating those sounds with their corresponding words. “One common misconception is that I can suddenly understand all the lyrics [of a song]. Imagine someone born blind who gained the ability to see later in life. If you gave that person a book, he would be able to see it, but would he understand? Absolutely not.